Make your French toast extra special by cooking it in a waffle maker. 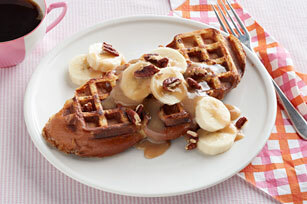 Serve it with a warm, thick, rich cinnamon maple cream over bananas. An oh-so-yummy way to make banana French toast. Spray waffle iron with cooking spray. Quickly dip 1 bread slice in egg mixture, turning to evenly moisten both sides of bread. Shake gently over pie plate to allow excess egg mixture to drip off. Slice bananas; spoon over waffles. Top with cinnamon-maple cream and nuts. For best results, trim the bread slices to fit your waffle iron before using. If your waffle iron is large enough to fit 2 bread slices, then you can prepare and cook this French toast in batches of 2 bread slices each.